Angelicscalliwags’ One Year Pond Study has had me excited about nature study in a way that hasn’t happened since … well, ever! Like angelicscalliwags, we’ve tried using an assortment of books, blogs and curricula for inspiration but nothing seemed to stick, so I contented myself knowing that with daily dog walks in the woods and by the river, summers at the beach and hours playing in our garden, C(9) and J(7) have plenty of opportunity to experience nature first hand. But the idea of observing a local ecosystem regularly over the seasons really captured my imagination. So a couple of weeks ago we set off to get better acquainted with our own beautiful local pond. When we researched the answer later, we discovered some experts say that the difference is just about size, while others say it has to do with depth: ponds are shallow enough for plants to grow across the entire pond bottom. This area where plants can grow is known as the “photic zone”, meaning the sun’s rays can reach the bottom. We also discovered that a person who studies bodies of fresh water is called a limnologist, from the Greek “limne” meaning “pool” or “marsh”. 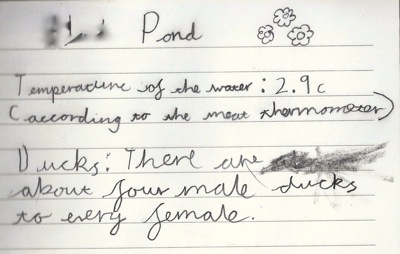 We saw mallard ducks – “about four male ducks for every female”, C(9) noted in her journal. Even evidence of moles – our puppy (happy to be finally let out of the car once we were safely away from the swans) was especially interested in these! We saw daffodils in bud. 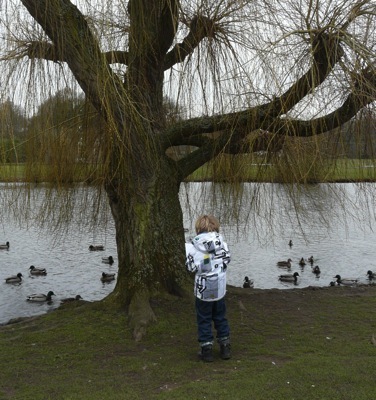 J(7) picked a willow tree to draw. C(9) tested the temperature of the water and was surprised to discover that at 5℃ (41℉) the pond was warmer than the air (2.9℃ /36℉). 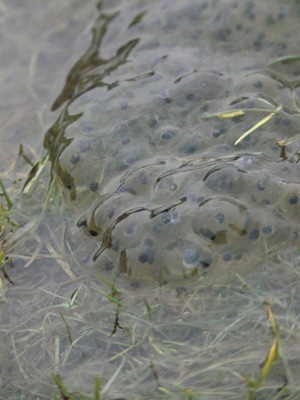 An unexpected bonus – Frogspawn! We struggled to find a benchmark to measure the water level in the pond, but we know it must be pretty high because the surrounding meadow area was covered in large puddles. It was in one of these puddles that we were excited to discover a jelly-like substance with lots of little black dots in – frogspawn! My mum said experts are concerned about frog reproduction this spring because with the late cold snap, ponds are too cold for frogspawn. Well our local frogs had found a solution – we just hope the puddles don’t dry up too soon! 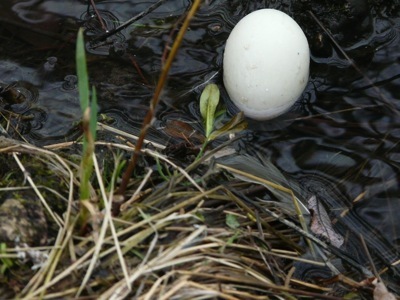 Also in the unexpected category – C(9) found a solitary egg drifting around the edge of the pond! 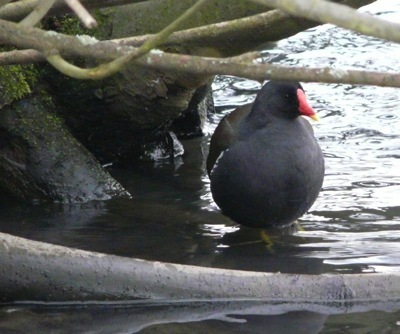 Our pond is in the middle of a popular dog-walking area, so we were find a tiny island which is close enough to shore for us to observe, but provides a small wildlife sanctuary from humans and their pets. 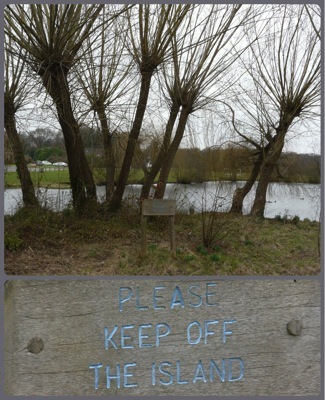 When we looked up the name of our pond (which is in the next village, about 5 minutes’ drive away) we discovered some fascinating local history: until the 1970’s, naked bathing was permitted there! There were changing huts (for those with more modesty, we speculated?) and even a lifeguard in attendance at 630am on summer days. How times have changed since I was a child! What a great time of year to begin a pond study. After a long winter with nothing much happening, nature is preparing to burst into life before our eyes. 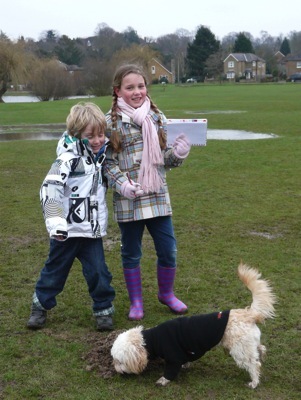 And as we braved the snow flurries (on 25 March!) 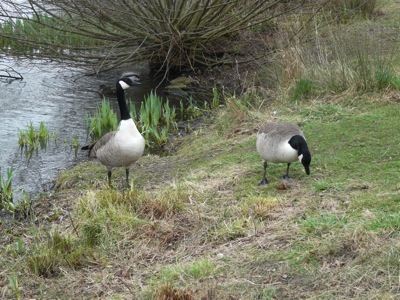 I imagined how pleasant it will be to spend time pond-side when the spring sunshine finally arrives! Thank you, again, for the inspiration, Claire and family! 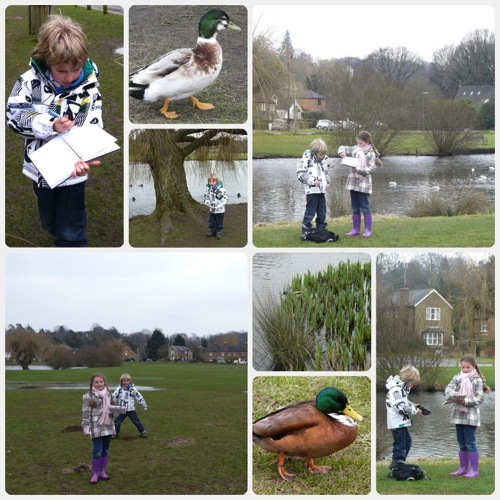 To see what other homeschoolers have been doing this week, visit Adventures In Mommydom’s Science Sunday link up, and for more outdoor kids fun go to Country Kids from Coombe Mill and Outdoor Play Party at Learning For Life. I’m so excited! 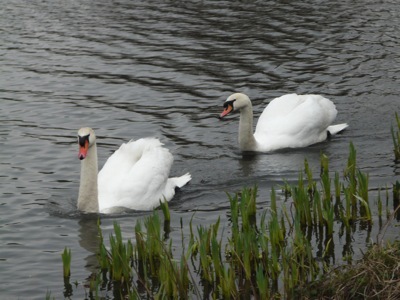 This is going to be very exciting to see the changes in both our ponds alongside each other, I’m so pleased you’re doing it as well! I think we need to start a world wide pond study- how great would that be? So am I! 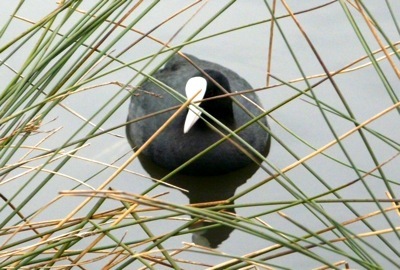 A world-wide pond study – LOVE it!! I think Claire is inspiring a lot of people to do this, she’s certainly got me wanting to do it. It’s great isn’t it? I hope more people post – I’d love to read about some more pond studies – I’ve got the bug! Have you thought about building a pond in your garden? It doesn’t have to be big to attract masses of wildlife. I wouldn’t have a garden without one now! Glory hallelujah for SPRING already! =] We are out daily in our woods at streams and this weekend we are putting first seeds and starts into the ground for our garden. Lula, please look my blog page up on facebook– The Crafty Homeschool Mama. I would enjoy staying connected a bit more with you. Your blog is a fantastic resource. Glory indeed!! Your woods look so beautiful. Maybe I will post more pics of our woods. They seem so commonplace to us but I love having a glimpse at the nature in other people’s parts of the world so perhaps I should reciprocate! I will definitely look up your page – it’s great to connect with kindred spirits, isn’t it? 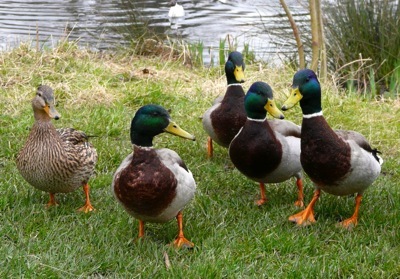 Hi Lucinda, thanks so much for joining in the Outdoor Play Party & for commenting as well. I love all that you covered in one day. 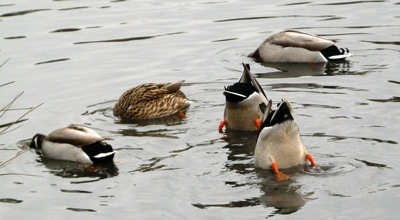 I love seeing the mallards & moorhens when we take the class to our local park. I look forward to following more of your adventures. Thank you. 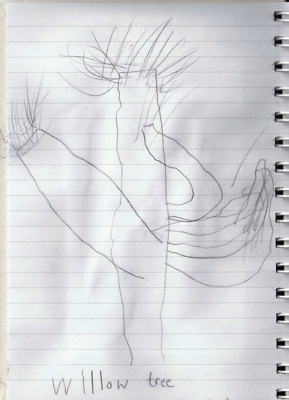 I’m really enjoying your blog and have forwarded it to my mum, too. She is always bundling the grandchildren in waterproofs! My two have just come in off the trampoline where they’ve been jumping in the pouring rain for an hour in pyjamas! It’s gorgeous 🙂 And it’s lovely how sharing it here makes it even more special! Such a lovely way to learn. We had the local primary school come to Coombe Mill for pond dipping last summer. They had a lovely time and learnt so much more than just looking in books in the classroom. 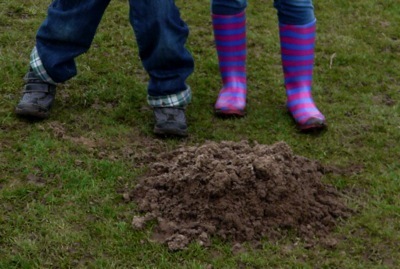 Thank you for sharing your finds on Country Kids. Absolutely. We love books but nothing beats getting out in the fresh air and experiencing nature first hand!